Don’t Crack My Back, Jack. A chiropractor adjusts the back of a patient. any city in the developed world. Perhaps the best measuring stick to a cultural phenomenon's popularity is if it has been lampooned in the Simpsons. Chiropractic has! Chiropractic is certainly not cheap and you are encouraged to visit multiple times a week, driving the cost up higher and higher. Frankly, anyone paying for such a treatment should be certain that it is helping them to get better. Chiropractors like to present themselves as proper doctors. The first consultation you have with a chiropractor will involve general health questions and some will do a spinal x-ray. 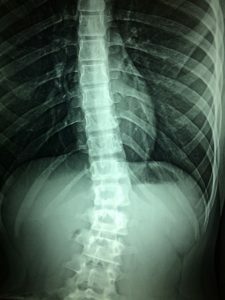 This will be shown to you at your second consultation, waved in front of you with an explanation that there is damage to your vertebrae and that immediate action needs to be taken to help prevent further degradation. It's a pretty slick sales routine in all honesty. The chiropractor will then manipulate your back, neck and any other joint that they care to do so. Essentially cracking these joints to make them feel better. Incidentally, you are never allowed to keep your x-rays and take them to another doctor for a second opinion. I wonder why that could be? Now there may be a shred of truth that chiropractic can help a sore back or neck, but then again, so can physiotherapy and proper sports massage. The problem lies in the claims that chiropractic can heal pretty much any illness. Their reasoning being that misaligned joints (or vertebral subluxations in the vernacular of chiropractic) prevents the bodies from healing itself. This is exactly what the manipulations do. Chiropractic was founded on the idea that during the manipulations "vitalistic healing energy" is released that helps to cure all ailments. Or at least this is what they claim. Chiropractic splits into two different approaches. "Mixers" and "Straights". Straight chiropractors will focus solely on neck and back pain. Mixers, on the other hand take the view that chiropractic is a panacea that can heal all of the body's ills. This is really where chiropractic starts to diverge from reality. It is feasible that chiropractic could help ease skeletal or muscular pain, and there is some evidence to suggest that they do, especially if there is a strong placebo effect involved. But to suggest that there is a release of a "vitalistic energy" that helps to heal is ridiculous. Many mixer chiropractors take this idea even further - that the release of this energy can help the body to heal itself from almost any ailment. This is an inherently dangerous idea. It may lead patients to eschew traditional medical care in favour of chiropractic. Chiropractic is certainly no replacement for proper primary care from trained medical professionals. Perhaps one of the reasons that patients choose chiropractic over traditional medicine is the idea that it is safer and a more natural alternative. A huge concern that many people hold is that a doctor will be over eager to prescribe drugs or even take a surgical path. Again, it is fairly obvious why avoiding drugs or surgery would be preferable, but in many cases that is the only treatment. There is also strong evidence that chiropractic can be unsafe, especially adjustments to the neck. Anyone considering chiropractic should carefully consider the risks and benefits compared to medicinal drugs or having surgery. Chiropractic has been known to cause strokes which can lead to death. Lives have been ruined by chiropractic. Now, of course, in the interest of fairness, it is only prudent to point out that sadly, people do die in surgery or have unpleasant side effects to drugs. The difference here is that these treatments have vast amounts of scientific literature supporting them. The same cannot be true for Chiropractic. Chiropractic tries to sell itself as a whole lifestyle rather than a single treatment. Chiropractors recommend many treatments for all kinds of health problems, despite really not having the training to do so. Earlier this year a chiropractor invented a glue that helps women during their periods by glueing their vaginas shut. Such "healthcare" is probably not really something that most are going to want. But it does illustrate how chiropractic wants to become people's first port of call for medical help. A horse undergoing a chiropractic manipulation. However, perhaps the two most damning things that I can present against chiropractic are the treatments provided for babies and animals. Despite there being no evidence to support chiropractic having any efficiency, it is not uncommon for chiropractors to perform adjustments on newborn babies who have nothing wrong with them. If chiropractic adjustments can risk death in adults, just think of the risk it can provide for babies. As for treating animals, why would you even do that? Most people who see chiropractors do so because modern medicine has been unable to help their back or neck issues. Sadly modern medicine is still poor at treating back pain. They are often desperate and are left with no other alternatives. If you are considering chiropractic. Make sure that the chiropractor is only interested in treating your back or neck ailments. That they are not convinced that there is a vitalistic energy that can help cure you of all diseases and that they do not stray outside of the remit of treating your back pain. You should also make sure you are fully aware of the potential risks involved. Are you unsure about how to tell which medical treatments are genuine and which are not? Maybe you feel that your scientific knowledge could be better. Well, Make Science Easy has science courses designed just for you. To ensure that you are armed with the knowledge and skills to navigate the complexities of modern life. And if you are studying for exams we will ensure you succeed. So, what are you waiting for? Sign up now!